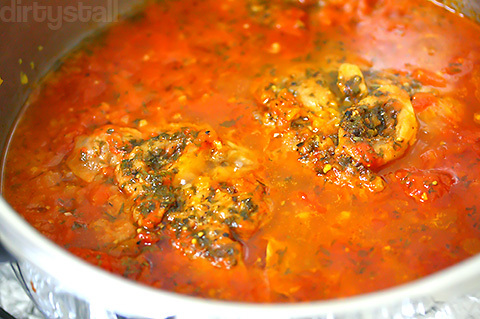 Osso buco alla Milanese is a classic dish from Milan, made by braising the cross-section of a veal shank in vegetables, tomatoes, white wine and a garnishing of gremolata. Typically paired with osso buco is the risotto alla Milanese, which is a saffron infused risotto mixed with bone marrow. 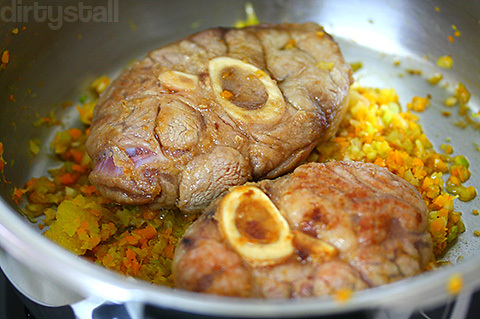 However when served with the osso buco, the bone marrow is usually left out of the risotto. 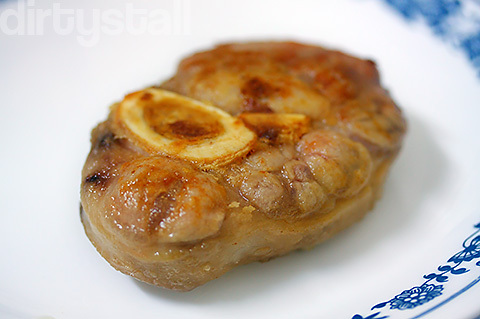 Here’s what the osso buco cut of veal looks like, with the name osso buco meaning ‘hollowed bone’, referring to the bone marrow hole in the center of the shank. 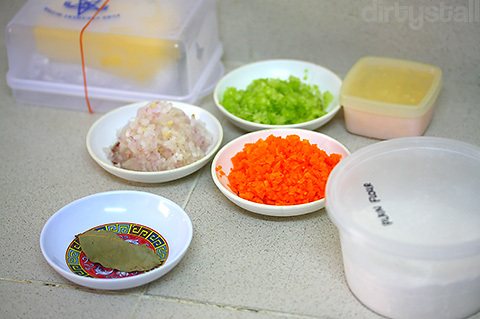 The base of the dish is formed by a soffritto of onion, celery and carrot, sautéed in butter for about 6-7 mins. 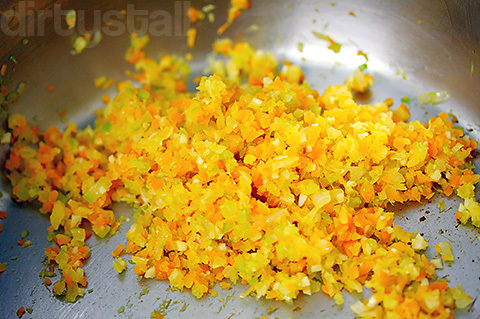 This is followed by a tsp of finely chopped garlic and a few small strips of lemon peel. I continued to sauté until the vegetables are soft and wilted. Next is to coat the veal shanks in flour and brown them over medium high heat. Place them over the vegetables in the pot, then use about 1 cup of white wine to deglaze the pan and add everything to the pot. Next add about 1 cup of meat broth. Then all the herbs and seasonings are added – black pepper, salt, a pinch of thyme, a few sprigs of parsley, 2-3 bay leaves, and about 1.5 cups of chopped/crushed tomatoes. The mixture should reach 2/3 of the veal shanks, if not add more broth. Traditionally you should slow cook it for about 2 hours in an enameled cast iron pot in an oven. 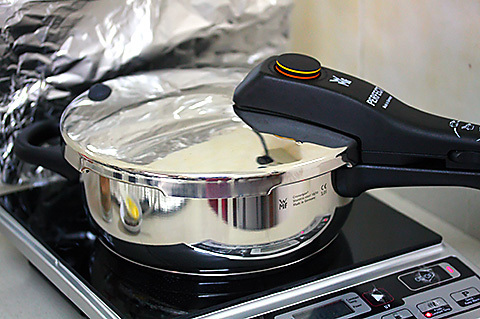 Without the luxury of time, I cheated and used a pressure cooker so that it was done in about 30 mins. When I opened it after 30 mins, a rich and aromatic fragrance escaped! And it looked damn delicious too! And here is the osso buco alla Milanese, garnished with the gremolata which is made from grated raw garlic, chopped parsley and lemon zest. 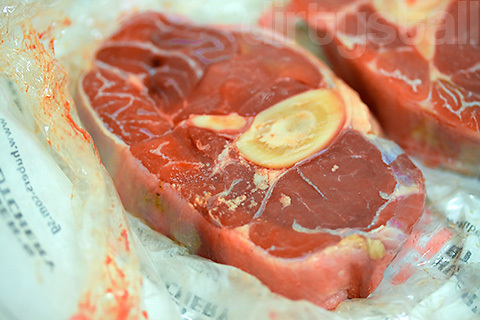 The tough cut of veal shank now becomes very tender, almost falling off the bone, and the marrow and connective tissues just melt into the broth, making it richer and creamier. Absolutely delicious when eaten with the saffron risotto! 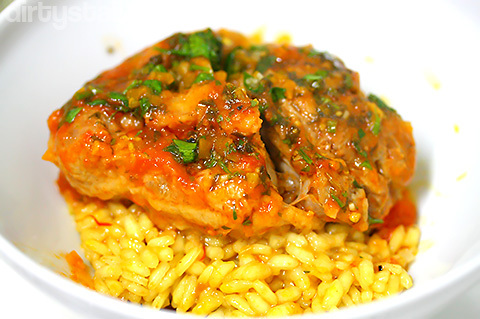 7 Responses to "Osso Buco alla Milanese"
can risotto be made from jasmine rice? Probably not. If you can’t get original Italian risotto rice, Japanese rice is a pretty decent substitute. How do you make your meat broth? I read that it’s one of the most essential for cooking. Hehe ironically, I’ve never had osso buco outside before so I have no idea how authentic is mine!